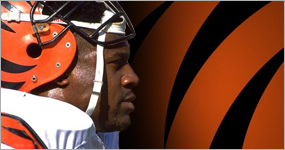 This year’s tournament will again feature Cincinnati Bengals great, David Fulcher. David will be attendance throughout the tournament, selling merchandise to help raise funds and awareness for his foundation. Last year David supplied such items as authentic jerseys, bobble heads, photos, and miniature helmets. Everyone in attendance will have the opportunity share their stories with Fulcher, and he will do the same! Participants will be able to purchase raffle tickets for a chance to play the man himself in a game of Tecmo Super Bowl! He will, of course, be manning the Bengals! Please visit the David Fulcher Foundation at www.Golf4MS.org and help David and his wife Judy in the their mission to find a cure for Multiple Sclerosis and to help those suffering from it along the way!